For many years I have looked at a picture on the wall of my office. It shows a water tower engaged in battling a fire at Tiger Stadium way back in the 1970s. To me it is an example of the type of situation Firefighters face on a daily basis. 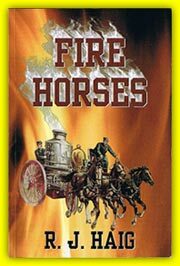 I never knew the whole story about this fire. Recently a retired Fire Captain came to my house and I asked him if he knew anyone who was at that fire. He satisfied my curiosity with the true story of what happened on that cold winter night. He was the driver of Ladder 12 when the fire occurred. Ladder 12 is a relatively slow company stationed near downtown Detroit. They are only a mile from the stadium. They could see a glow and smoke as they pulled out of quarters. The officer in charge was Bill O’Dell. On arrival the guard came to the front gate and was unaware of the fire burning in the press boxes high above the playing field. 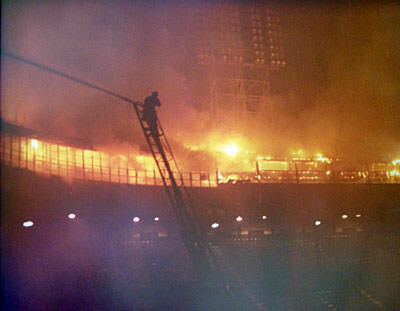 At first he refused to let the ladder truck enter the stadium. Lt. Bill O’Dell climbed out of the rig and turned into the Incredible Hulk. The gates were quickly opened and the guard disappeared. O’Dell and his crew were able to get the 100 foot aerial into position where they could see flames and smoke and start working a water tower. Other companies were arriving and the Chief called for a multiple alarm response. The driveway into the ball field area was opened and the sight of the fire in the press box area promised a long hard night for Detroit Firefighters. The next two ladder trucks that came into the stadium got stuck in the two feet of snow that covered the entire inside of the ball park. Firefighters moving hose lines and equipment were hampered by these difficult conditions. It was like fighting a fire on the Eastern front in Russia during World War II. Heavy hand lines would have to be taken upstairs to attack the fire from below. By now the entire press box area was involved with fire. Nobody could find a stairwell. There was only one elevator and that was not an option because the doors would open to a raging fire. Lt. O’Dell was searching for a way up when he bumped into a little kid. The kid said, He knew how to go upstairs and pointed out a ladder attached to a wall that led to a trap door. O’Dell said they were able to get up that ladder and get a line working. Through a super effort the fire crews started to roll the fire back. The fire lasted most of the night. O’Dell said he never saw that little kid again. He must have been a gift from the gods who protect Firefighters. It was a good stop and a job well done in extremely difficult conditions. I enjoy looking at that picture. The story I was told matched what I imagined did occur. It still makes me smile to think that my Department was putting on a great show in Tiger Stadium and there were no spectators to watch the action.